Loctite Premium Construction Adhesive is foam safe and creates a very strong bond. I tried a couple of different adhesives. 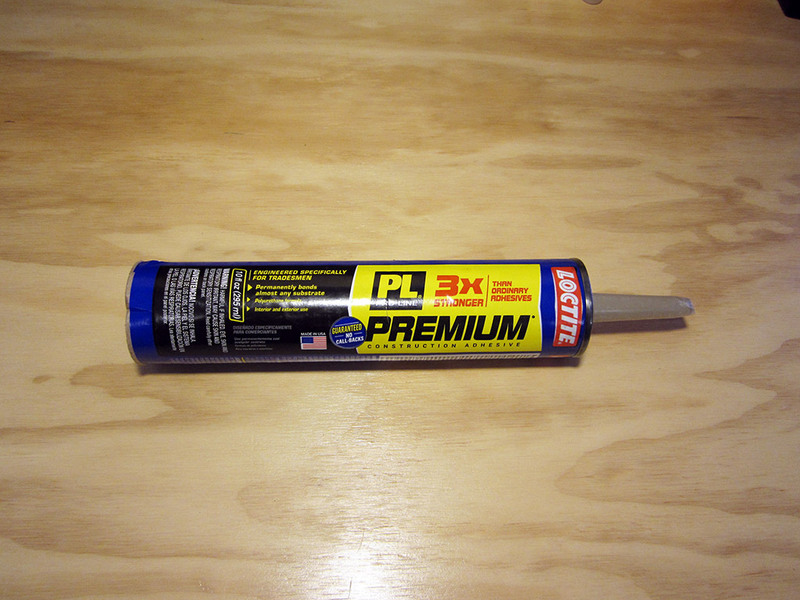 The one I ultimately settled on was Loctite Premium Construction Adhesive. It doesn’t attack the foam and it dries hard as a rock. I found the hardness of it to be particularly useful as it allowed me to set the panels at exactly the right height, then when it cured, they wouldn’t move up or down. 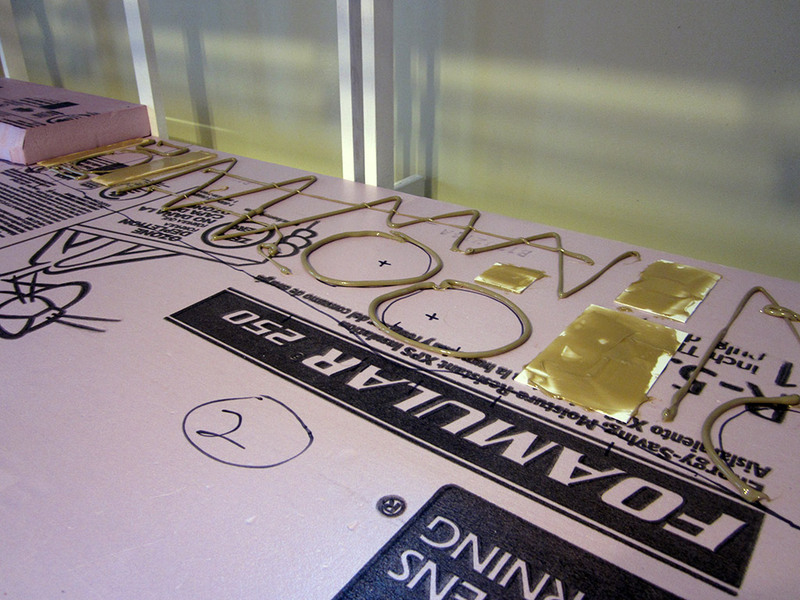 I did try some Liquid Nails adhesive that’s designed specifically for foam insulation panels, but I discovered that it stays very flexible and doesn’t create a very tight bond. I was able to pull two test pieces of foam apart even after they had cured for 24 hours. Each baseboard consists of 3 pieces: a 1″ thick base, a 2″ thick section that the track rests on and a 3/4″ section next to the 2″ section that will act as the base of the water. This will put the surface of the water about 1″ below the top of the 2″ foam. I found that the 2″ foam was not terrible consistent in it’s thicknesses and the piece on the middle baseboard had to be shimmer slightly to bring it closer to level with the baseboard on one end. A little sanding and everything should line up nicely. 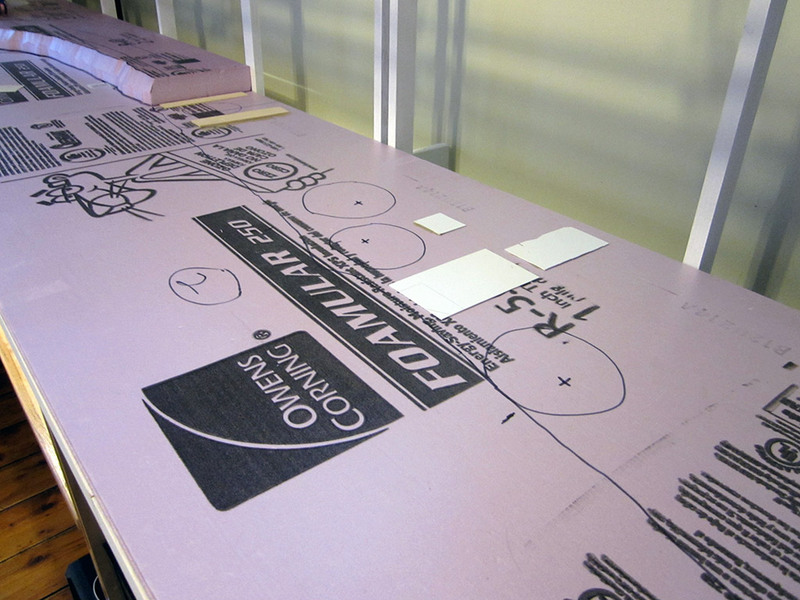 Before laying down any adhesive, I traced out the locations of all the switch motors. The adhesive dries very hard so I wanted to make sure there wasn’t any in locations that I would have to cut through later (note the circles in the photo). 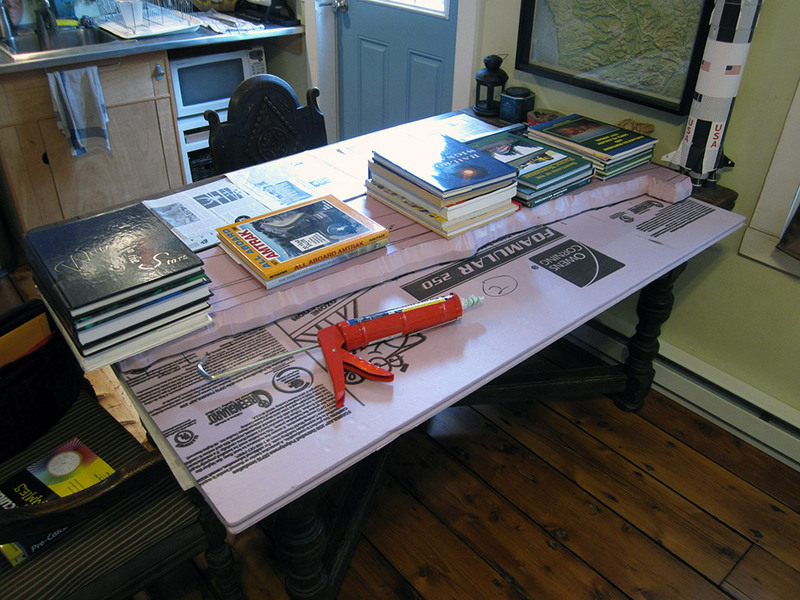 I applied adhesive thinly to the shims and in thick zigzags to the rest of the foam, then I sandwiched the two pieces together, moved them to my kitchen table and weighted them with books for 24 hours. One of the two joints between baseboards. 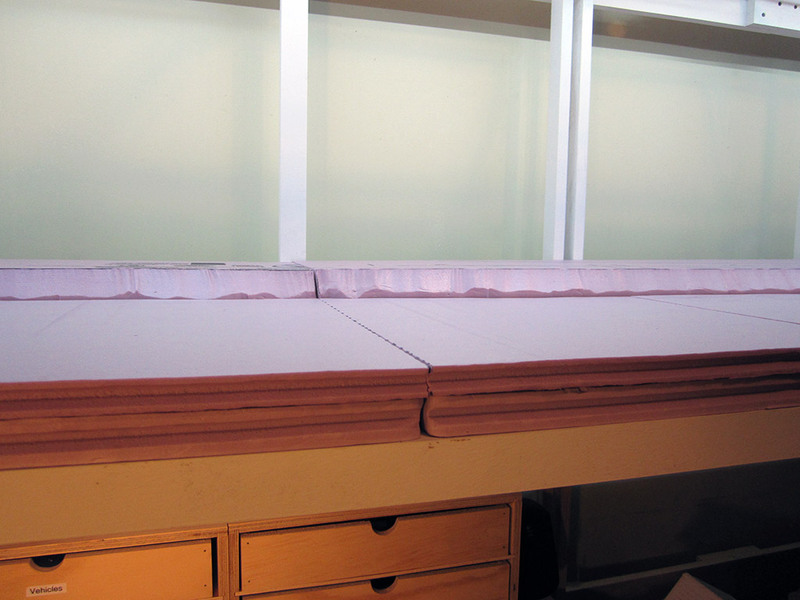 Overall I was pretty successful getting the baseboards even and with a minimal gap, however they’re not perfect. It’s going to take some fairly messy cleanup with a palm sander. I’ve also decided to fill the gaps between baseboards with caulk. When it’s time to move, I’ll just slice the caulk out of the joint and reapply it once the layout reaches it’s new home (which will hopefully be permanent). Looks like great progress. Thanks for the update. I had traditionally used the Lepage (brand) equivalent of the adhesive you’ve used to laminate together the three layers of foam you’re using. I found that I could never quite get a bead that was thin enough to really get the layers to settle tight together. While browsing around Home Depot I found a latex contact adhesive (also by Lepage, not sure if it’s available in your area). Being a liquid it was easy to apply broadly yet it was easy to get the sheets to stick together tight once the adhesive had tacked nicely. I like the idea of caulking the joint between the modules. That’s something I should adopt into my home layout.